The President left Nigeria on Saturday, April 28, 2018 for the US in preparation for talks with President Trump. The Peoples Democratic Party (PDP) has called on the United States President, Donald Trump to caution President Buhari. 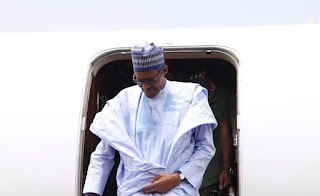 The President left Nigeria » on Saturday, April 28, 2018 for the US in preparation for talks with President Trump. According to the PDP, Buhari has succeeded in suspending the constitution of Nigeria. This was made know to newsmen by PDP’s spokesman, Mr. Kola Ologbondiya. The party also alleged that Nigeria has become a police state, adding that the country has returned to the 1984 military era. Buttressing Ologbondiya’s statement, the PDP chairman, Uche Secondus also alleged that nobody is safe under Buhari’s government. This was revealed in a statement signed by his Special Assistant on Media, Mr. Ike Aboyi. Ologbondiya also alleged that Nigerians are being arrested without cause. He also called on President Trump to find out from Buhari how the Nigerian government is being run. The PDP spokesman added that “Nigeria is facing a perilous time; our constitution has been technically suspended; we have now become a police state; governance has reverted to the nightmares of the 1984 era, when draconian leaders held sway and forcefully held our people under the grips of military Decree 2. “Currently, there is a total collapse of respect for constitutionally-guaranteed personal freedom. There is no regard for the natural course of justice, life in Nigeria is gradually returning to the state of nature and there is fear everywhere. “Indeed, the height of human rights abuse being witnessed in our country today is the worst in our national contemporary history. “As we speak, government’s inaction and aloofness have led to escalation of killings in Benue, Taraba, Adamawa, Kogi, Kaduna, Borno, Yobe, Nasarawa, Edo, Zamfara, Ekiti and Enugu by insurgents and marauders, who are having a field day as the Presidency has abandoned governance for 2019 reelection bid,” he added. The PDP also said that Buhari has lost popularity » in his hometown, Katsina and Nigeria.